This was my first experience with of the true "wonders of the world". Indeed, this place, where history, art and architecture both struggle and harmonize with the dense surrounding jungle, exceeds all expectations. Collectively, the ruins known as Angkor contain over 40 accessible sites amid some 80sq. miles (200sq.km.) 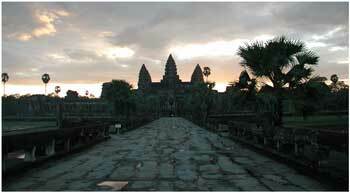 of jungle, including temples, terraces and gateways signifying the dominance of the Khmer civilization. During the height of the Khmer rule, their kingdom included not only the homeland of Cambodia, but most of modern-day Thailand, Laos, and Vietnam. Many examples of Khmer architecture and design can still be found in throughout these SE Asian countries, lasting symbols of their wide influence. The temples were constructed between 900-1500 AD, in various styles and using a variety of materials including plaster, brick, stucco, laterite (local mudstone), and sandstone. Most of the sandstone used to build the temples came from one place, the Phnom Kulen mountains, 20 miles NE of Angkor near the Tonle Sap lake and river, and it is hypothesized that the Khmer used these waterways in conjunction with a series of manmade canals and moats to transport by raft the millions of tons of stone necessary to build the temples. It's also widely believed centuries of building the temples actually weakened the Khmer, denying valuable resources needed to feed, house, defend and maintain the rest of the empire, leading to their eventual downfall as the leading kingdom of Indochina in the mid second millennium. I found Angkor to be pretty much astonishing at every turn. Many of the temples have been restored and strengthened against their own decline to some degree, allowing one to get an idea of their original grandeur. Others have been left to the jungle with minimal renovation, allowing one to experience them virtually undisturbed in their struggle with the forces of time. 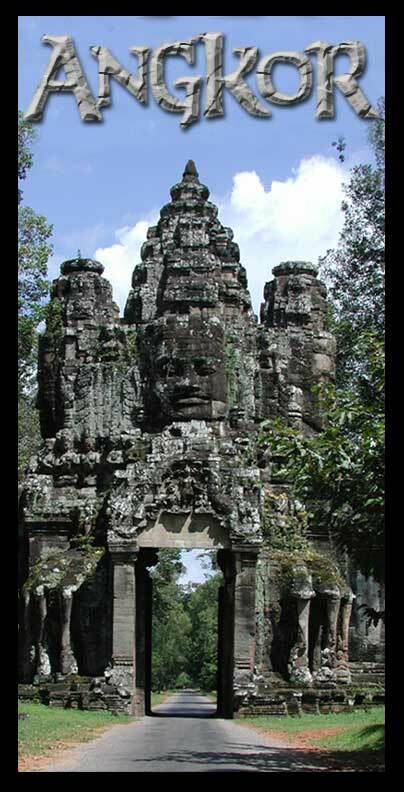 Above is one of the gateways to Angkor Thom, the main city which was surrounded by a wall with 5 gateways. To the right is the main entrance terrace to Angkor Wat, the outer quad resembles a huge art gallery with carved reliefs covering hundreds of meters of sandstone wall, many depicting battle scenes and royal functions. 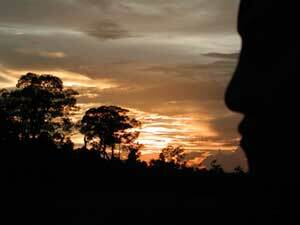 Whether Angkor Wat was meant as a temple, tomb, library, etc., is debatable. Although Angkor Wat features Hindu motifs, the Khmer began accepting many influences from Buddhism during their reign, and many of the temples use both design styles. 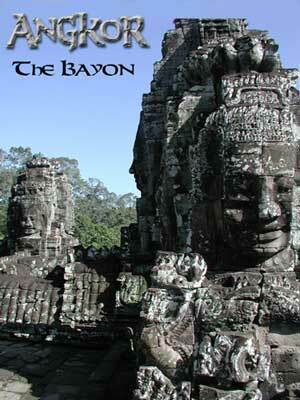 The Bayon lies at the center of Angkor Thom, and is actually built upon an earlier temple. It was originally thought to be Hindu influenced from the 9th century, but recent evidence confirms it's actually Buddhist and from around 1200 AD. 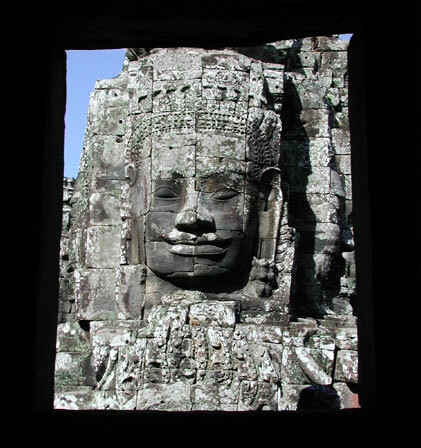 The Bayon is rectangular in perimeter yet lies in and oval moat, and consists of 54 towers, with over 200 large faces carved therein-always the same face. Some say the face depicts Buddha, others believe it is the image of Jayarvarman VII, the Khmer king who ordered its construction. In addition to the faces, the Bayon includes many galleries throughout its three levels, as well as elaborate carvings on the outer walls and terraces. The construction of the Bayon, which took place roughly 100 years after Angkor Wat, marked the last phase of prominent Khmer architecture. 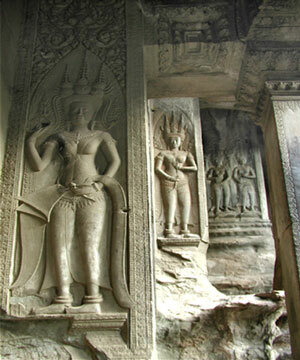 Above: Relief carvings in sandstone at Angkor Wat. Below left: a panoramic shot of the rice paddies on the road to Phnom Kulen. Click for enlargement. Angkor lies just a few miles outside Siem Reap, which was a pretty tiring 14 hour bus ride from Bangkok. As with most legendary destinations, getting there is half the adventure. Due to a washed-out bridge, our trip involved a river crossing on a footbridge made of a single 2"x4", at night, carrying full packs. Just another good reason to always carry a petzl. 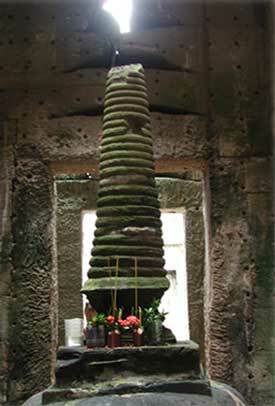 Below is an altar piece in Ta Phrom that replaced a unknown figure stolen by temple vandals.